Special Containment Procedures: SCP-764 is to be kept in Hazard Vault MT-███, with unlocking mechanisms only operable by two Class 1 Researchers or higher working in tandem. No personnel are to enter without proper safety precautions, and no personnel are to be in Hazard Vault MT-███ unless under the direct orders of Level 4 personnel or as part of an approved destruction attempt. Personnel entering Hazard Vault MT-███ are to wear the locking gauntlets in Containment Supply 313, size 14, and the key is not to be brought into the vault. The gauntlets physically prevent attempts to don SCP-764 due to their size, and therefore permit SCP-764 to be handled with a modicum of safety. 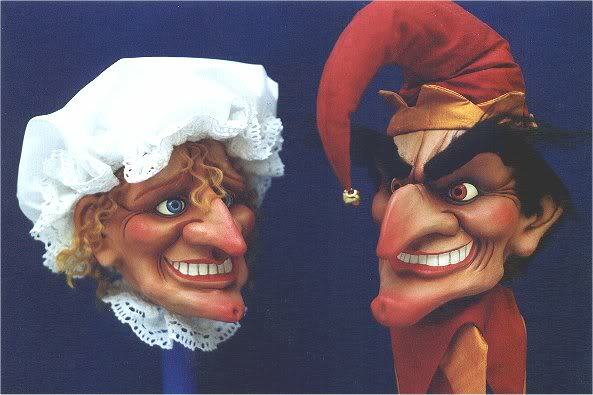 Description: SCP-764 is a pair of Punch and Judy puppets that display no exceptional characteristics upon visual inspection. When observed by individuals with no barrier between them and SCP-764-1 or SCP-764-2, a compulsion comes over a single person to 'put on a show' utilizing the puppets, even if none present have any skill, talent, or training regarding puppeteering. All others feel an overwhelming urge to watch the show, regarding all events taking place as the height of entertainment until the show is over. As the subject dons SCP-764-1 and SCP-764-2 (in no circumstances have SCP-764-1 and SCP-764-2 been seen placed on separate performers), any individuals without physical barriers between themselves and SCP-764 will find themselves compelled to sit and watch the show. The show begins as a normal Punch and Judy show, with light slapstick comedy and violence occurring between the puppets. After a period of three to five minutes, an individual will be chosen from the audience and brought forward, participating in a part of the show (typically playing as a police officer or constable, but in Incident 764-34d, the subject played as E-class Agent Jonathan █████████, an individual who was part of the team responsible for recovering SCP-764). A lighthearted exchange will occur between the 'volunteer' and the puppets before the violent slapstick resumes, but after this exchange, both puppets will brandish appropriately sized weapons and begin to viciously attack the 'volunteer'. The remaining audience will find this even more amusing than the previous antics of the puppets, and even the 'volunteer' will laugh until SCP-764-1 inflicts the final and invariably fatal wound, quipping, "That's the way to do it!" Another short delay will ensue as the puppets banter, until another 'volunteer' is brought forward and the process repeated, with the roles assumed by those coming forward becoming more and more bizarre as the show progresses. The show will conclude with the puppeteer's death, or after four to eleven individuals are killed, at which point the puppeteer will begin removing the puppets and ask, "Did you enjoy the show?" and receive as a response from all surviving audience members, "Yes, Professor." A show concluded in this manner will negate SCP-764's ability to mentally influence individuals for anywhere from eleven to twenty-six minutes. Incident Log 764-23b - This containment breach occurred when a D-class personnel in the process of moving SCP-764, opened the crate containing SCP-764. The door to Hazard Vault MT-███ was immediately sealed and locked. A recording device was brought in after approximately two and a half minutes to record the remainder of the incident. SCP-764-1: Oh no, he's sick! We'll have to operate! SCP-764-2: But, Punch, you're not a doctor! SCP-764-1: Has that stopped me before? D-88778 laughs again, then resumes coughing. SCP-764-1 brandishes a scalpel about half its length. SCP-764-1 begins humming to itself as it cuts into D-88778's throat, who seems to be stifling a laugh. SCP-764-1 reaches into the incision and fumbles around before grabbing onto something and tugging. SCP-764-1: I think I've got it, there's something in his throat! We'll save you yet! SCP-764-1 pulls out the hyoid bone and shakes it in the air triumphantly. SCP-764-1: Toldja I could do it! SCP-764-2: He needs that, y'idiot! SCP-764-2 begins hitting SCP-764-1 with a tiny rolling pin. D-88778 makes a noise that may be laughter. SCP-764-1: Ow! Stop it! I'll fix 'im, you'll see, woman! SCP-764-1 puts the scalpel back into the incision and begins sawing the blade. After a moment, SCP-764-1 reaches in and begins pulling, as blood begins to spray. Approximately four inches of the carotid artery are pulled out of the wound. SCP-764-1: That's the way to do it! Both puppets slump to the ground as D-88778 collapses.